Cary Fukunaga’s film Sin Nombre can sit comfortably alongside City of God as a powerful and bleakly artistic take on the compact chaos of street gangs and the moral erosion of poverty and the violence which ensues. Two stories clash in a hopeless and violent world as Casper, a member of a brutal Mexican street gang, kills his leader as they rob a train carrying Sayra, a teenage Honduran running the dangerous path to America to reunite with her family. One saves the life of the other, and as they both realise they cannot turn back their roads intertwine and we follow their escape, with the law and the gang taking up the chase. Thanks to the capable eye of the cinematographer Adriano Goldman the film luxuriates in the juxtaposing of the Mexican vistas with the crowded confusion of the cities; the film breaks in the middle to let our gaze bath in the warm open blue sky with a distant plane cruising through the air and once we’ve taken a breath we’re back on the road with the hundreds of desperate souls clawing their way to a promised land. It is a futile notion, to hope that a better life awaits. The tattoos which cover the skin of the gangs permeate to their bones and there is no way to take the train off its tracks. Witness Sayra half asleep watching Casper try to scratch off his teardrop tattoo as their journey continues, despair travels with him, and Sayra is with him for the ride knowing, as do we, that she will reach her destination alone. Writer and director Cary Fukunaga’s research, riding the trains, immersing himself in the Latin American gang mythology, imbues each and every frame of the film, allowing the familiar conceits of a well worn story to engage at every turn. The crystal clear definition of the Blu-ray blushes the screen with the radiant colours and every carefully framed shot is incandescently rendered. The grit and grime of the streets is tangible and Fukunaga allows the ebb and flow of his pacing to carry us along with the two leads, and though the story of the escape of a good-hearted young man caught up in a dangerous cycle of violence and an innocent and naive woman trying to find a better life is nothing new, each new scene compels the viewer to see what happens next. There is no escape, no release to be found at journey’s end. Sudden, immediate violence punctuates a desperate race to an impossible freedom, and the casual indifference of the early violence combined with a sickening realism in Fukunaga’s direction brings the two strands of the story together in a genuinely affecting denouement. The cast are uniformly excellent with the two leads, Edgar Flores and Paulina Gaitan, exerting a hold over the heart of the film. Their scenes together play out as if the weight of their worlds are on their shoulders and the gang members are a bleak and violent presence but never stray into cliche, something that is so important to this film. See this film, take time to experience it. The sparse script belies its depth and precision, the characters are engaging though never surprising. It is an oft told tale, writ large and capably over a torn canvas. That this was Fukunaga’s feature debut is nothing short of astonishing and it will never get an English language remake, so if subtitles scare you – this is a great place to expand your horizons. 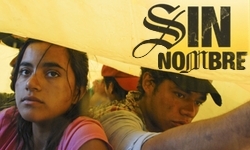 Sin Nombre is out on DVD and Blu-ray on the 1st of February, complete with a commentary and deleted scenes. Previous articleMiramax is Dead. Long Live Miramax.